Ahhh macarons. These little sweet treats are everywhere. Love them or hate them, it's hard to escape them. My opinion on macarons is a little confused. First of all, I shouldn't be eating them - I'm supposed to be allergic to almonds. But I eat them anyway because they haven't made me sick yet. Sometimes I find them insanely sweet, and can get a little nauseated if I have too many...like the time I ate 48 in one day at Adriano Zumbo. But as a learning home baker, these little babies are the perfect challenge. There are SO many things that can go wrong. You could have made them 10 times in a row and have them turn out perfectly, only to have your next batch turn out awful. But ohhhh how glorious it feels to succeed! To press your nose up to the oven door and see those little feet pop up! For those who have yet to understand the macaron craze, at least try to make them yourself because they taste so much better once you are victorious in your quest for macaron feet (particularly after 3 failed batches have been thrown in the bin). 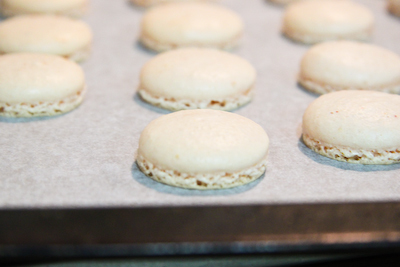 So why am I rambling on about the joys of baking macarons? Last night, I made a last minute decision to bake these mandarin flavoured shells to go with my leftover homemade rhubarb jam that I made previously. And everything went exactly to plan. Baking is so much more fun when you're more confident and not experimenting with crazy new recipes. It was relaxing, almost therapeutic, and I can look at these in a much happier light compared to those bloody madeleines that gave me so much grief. But there is always room for improvement! The mandarin flavour turned out surprisingly well, considering I only used the zest from a Hickson mandarin. You could certainly replace the mandarin zest with lemon or orange zest, in fact I would strongly encourage you to try lemon zest as a substitute because I am still completely obsessed with the lemon & rhubarb combination. But I do like the rhubarb and mandarin combination, it has a very Winter fruit-y theme about it. Anyway, it's such a relief to be finding comfort in baking at the moment, it takes away all the stress from earlier in the day. I've always had trouble adapting to change. I like routines. And right now there are changes occurring in my life that I am struggling to process and adapt to, so it's good to come home and fall into the comfortable routines of baking. Yep, I'm totally gonna go hug my oven now. Line two baking sheets with baking paper. Place icing sugar in food processor and pulse for a minute to remove any lumps. Stir in almond meal and pulse a few times to combine. 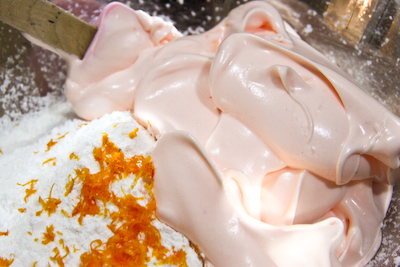 Place in a large mixing bowl with mandarin zest. Beat egg whites and egg white powder in a medium mixing bowl until the egg white powder dissolves and it reaches soft peaks. 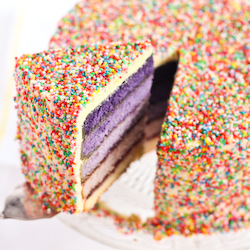 With the mixer on high speed, gradually add sugar (and food colouring) and beat until it reaches stiff peaks. 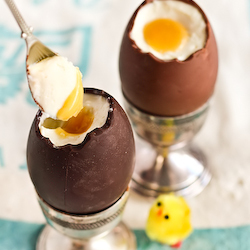 Add meringue to your dry mixture and mix, quickly at first to break down the bubbles in the egg white, then fold carefully as the dry mixture becomes incorporated and it starts to become shiny again. Take care not to overmix, the mixture should flow like lava and a streak of mixture spread over the surface of the rest of the mixture should disappear after 30 seconds to a minute. Place in a piping bag and pipe rounds of about 3cm diameter on lined baking sheets or silicon baking mats. Gently rap your baking sheets on your bench top to remove any extra bubbles from your piped shells. Preheat your oven to 140-150 degrees C (temperature varies depending on your oven). Leave shells on bench to dry for about an hour, so that when you press the surface of one gently it does not break. Place on top of an overturned roasting tray or another baking sheet if they are not professional grade. Bake for 13-15 minutes, depending on the size of your shells. Remove from the oven and cool on the tray for a few minutes, then gently remove from the sheet and place on a wire rack to cool completely. 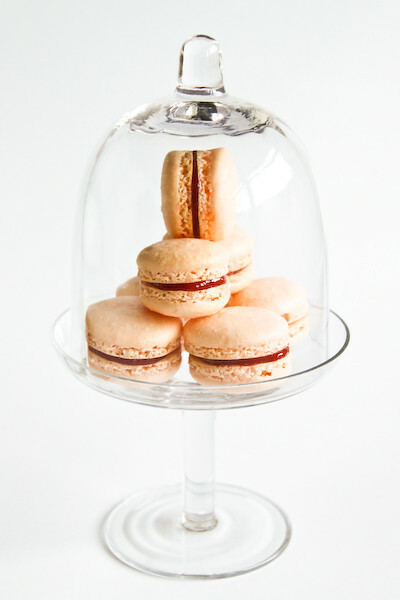 Sandwich macaron shells with about 1 tsp rhubarb jam and refrigerate overnight to allow the flavour to mature. Serve at room temperature. Can be stored for several days after baking in an airtight container in the fridge. EDIT: I don't care what Masterchef says, it's not pronounced macaROON. It's macaRON! 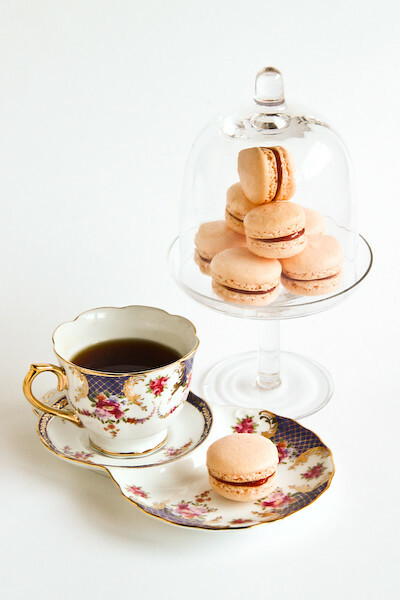 These are just picture perfect macarons! Like seriously, PERFECT. 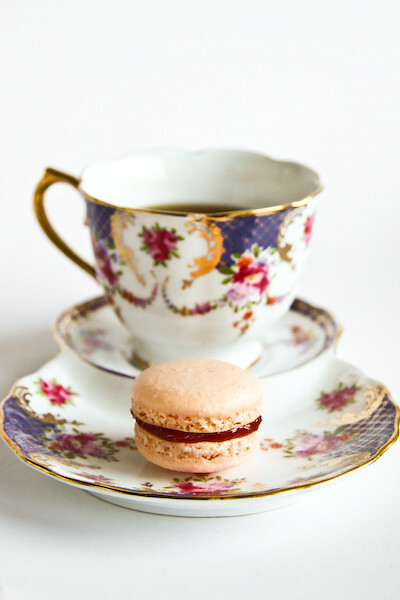 And omg, I want that teacup set and little cupcake stand from UO! They are just too adorable and thanks to you, I've fallen in love with them! 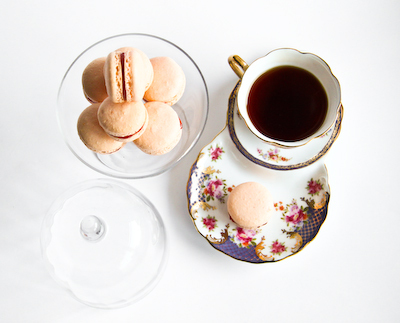 I absolutely adore your photos of your little macarons. Absolutely gorgeous. Not to mention that mandarin and rhubarb sounds like heaven! I love anything slightly citrusy and sweet at the same time, so this is right up my alley. 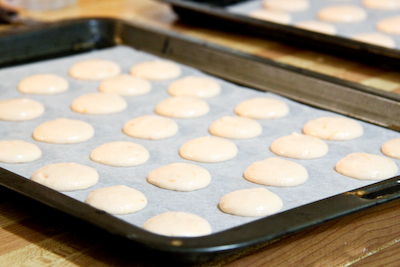 I haven't tried baking macarons yet, am a bit daunted and not sure if mine will have little feet.. amongst the many other things that could go wrong! These are great looking macarons. I am still on two failed batches. One day I will hit the jackpot. I love the tea cups. So pretty. You are an expert an macs. I'll need to try this recipe. They have such a perfect shape to them. They look perfect, well done! 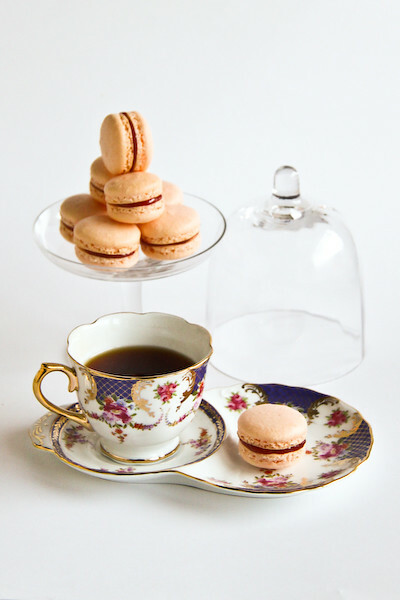 IF the whole sydney is blogging about macarons today, yours would be the best of them all!!! holy moly, save me one. please. I love the way you've set it up, the tea cups adorable & the stand is precious. I'm pretty sure you're macaroon queen! These look gorgeous Steph! And I love love love the teacup set! I think I saw it on UO too :D Haha yay for the oven love! I want your teaset! And macs. absolutely gorgeous and the flavor combo is wonderful. Some seriously awesome photos. Love them! Mandarin and rhubarb is an interesting flavour combo. Would never have picked it to pair well with each other. agreed about the pressing nose against the oven door and then claiming VICTORIOUS! people always ask me what's the difference between a good batch and bad batch, and honestly the only thing i can ever say is that it is all about what you are thinking about while you are making them. if you think about the luandry: fail. if you think about the first time you met your husband: success. your macarons are so perfect. The shape, the feet, even colours, oh how I envy you!Btw I love that rhubarb jam, I've basically used it on everything. Gorgeous & so picturesque. And 48? Did I read that right? 48? Did you pee sugar crystals after that? I am impressed at the dedication! What pattern is your teacup and dessert plate set? I love it, it's gorgeous!!!! 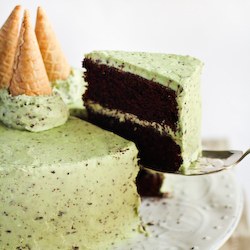 I love everything about this post from the pictures, recipe and down to the cake stand and teacup set! Absolutely Gorgeous!!! I have yet to conquer macarons. Yours sound (and look, of course) delicious. As always, you photographed them beautifully. You could easily make money selling your macarons!! Great macs .... lovely your creativity. BTW, could you please tell me where you bought the egg white powder from?? Ange - Thanks so much! I got my egg white powder from The Essential Ingredient, that's the only place I've been able to find it. Hope that helps! 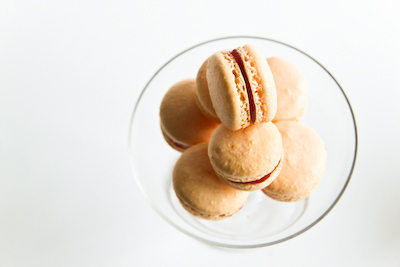 Your macarons are so perfect, and I love the sound of mandarin and rhubarb. I need to try making them again, there's so many flavours I want to try! I think enough time has passed since macaron day, been craving them lately! Here here to correct pronounciation of the macaron! That sounds like an interesting combination. Karen @ Citrus and Candy - Aww thanks babe!! Hehe get it!! It's so cute, I love everything from UO. chocolatesuze - Haha I know, I'm a weirdo. HUG! Celeste @ Berrytravels - Thank you so much! The mandarin-rhubarb combination is so great! Macarons are tricky little things and I had to fail a lot before I got good ones! Give it a go! Mark @ Cafe Campana - Thanks :) Aww don't worry, we all have to fail a bit, it makes the success even sweeter! A cupcake or two - Thanks I love them too! Tartelettes recipe is such a winner, just takes a few goes to get the oven temperature right! Laura - Haha sorry, all gone! Aww thanks! Betty @ The Hungry Girl - <3 Ovens! and tea cups! and UO! we are totally addicted. Phuoc'n Delicious - Thank you! OOH good luck! Jacq - Yay yours turned out awesome! So glad you started making them :) Definitely worth the effort! Mr. P - Hehe isn't it great! Thanks! Simon @ the heart of food - Yay! Glad you like them :) They go great together, trust me! Mallory Elise - Hahaha I love that theory! I must remember to always think of happy things when making macs :) Haha i think it's actually meant to be a catchall for jewellery but as if I'd waste it on that! linda - Aww thanks hun! No need to envy me, your gorgeous macs are what inspired me to start baking them again! The rhubarb jam is the BOMB!! Forager - Hahaha that was a bad day. I felt so so ill after! 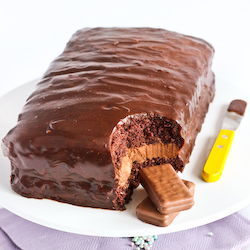 Emma @CakeMistress - Try it try it! It's worth the pain I promise :) Haha never eating that many again EVER! Helen (Grab Your Fork) - :) Thank you! Oven TV, love it! MIK - haha I got it from Urban Outfitters. Unfortunately it's not available anymore! Lisa - Thank you lovely! It's definitely been enough time, get back in the kitchen! bibibourgeon - Aww yay! I hope you don't give up, it takes a while but it's so rewarding when you get them right!